Hadokam is a collaborated street fighter 4 hack accomplished during the 24-hr hackathon GameHackDay NYC 2011 by Liangjie Xia, Bruno Kruse, Diego Rioja, Mustafa Bagdatli and myself. We developed software to manipulate a frontal picture of the player’s face. It is projected onto the 3D character model extracted from the original game, generating a replacement skin texture file swapped back into the game for real gameplay. 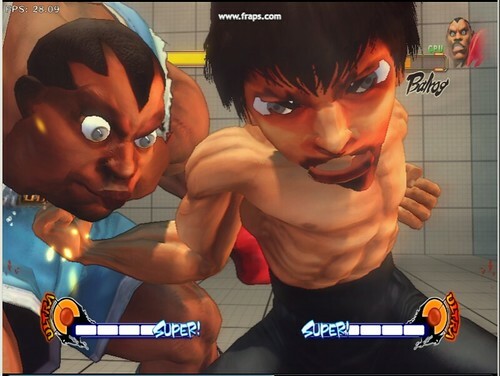 The character-model’s proportions have also been modified to create a Big Head Mode, making the players’ faces the main attraction. This makes for much more rewarding gameplay – the vicarious friend beatdown. A custom controller board was built (from a repurposed Mortal Kombat 2 arcade panel found on the street) to for an arcade experience. 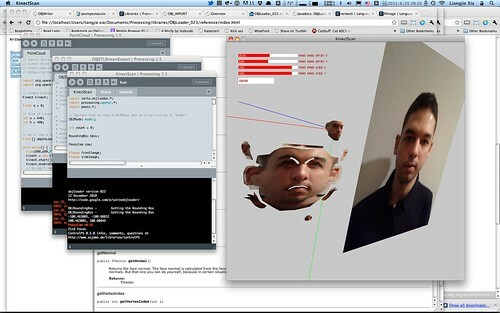 Face mapping and texture generation is done with Processing. The arcade controller is read by a multi-plexed Arduino that outputs serial data to be read by joystick simulation software. There’s tons of screen-captured game play, but in the meantime, here’s a quick teaser. Check out the Hadokam and other projects from the hackathon on the GHD wiki.